Here is a drone footage movie of the LWA-SV station produced by Paul Harden. Hopefully this will give you a feel for what an LWA station looks like. If you want to know how we build LWA antennas then check out this movie from Niky Taylor showing all the steps. The LWA will be a low-frequency radio telescope designed to produce high-sensitivity, high-resolution images in the frequency range of 10-88 MHz, thus opening a new astronomical window on one of the most poorly explored regions of the electromagnetic spectrum. This will be accomplished with large collecting area (approaching 1 square kilometer at its lowest frequencies) spread over an interferometric array with baselines up to at least 400 km, located mainly in the state of New Mexico. 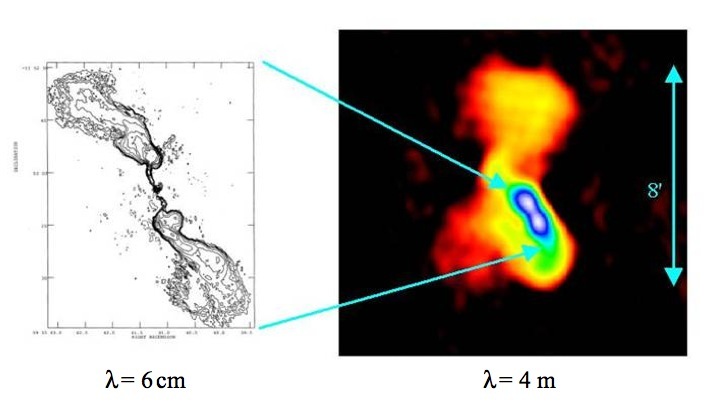 The images shown to the left are of the galaxy Hydra A, mapped at 6 cm and 4 m (74 MHz) with the VLA. Only at long wavelengths is the full extent of the source revealed. Such images have fueled the activity behind the planning and creation of this array. The LWA will be sited in New Mexico, with the core near the site of the Very Large Array, but will encompass interferometer stations spread throughout and possibly beyond the state of New Mexico. Current plans call for the start of operations in 2010. The LWA Project includes several institutions. The founding LWA members are the University of New Mexico, the Los Alamos National Laboratory in partnership with the Naval Research Laboratory. Virginia Tech and University of Iowa joined the LWA Project in July 2007 and the Jet Propulsion Laboratory joined in September 2008. The SKA project officially recognizes the LWA as an SKA Pathfinder. To download some brief information click here for a popular information sheet or here for a more technical brochure. A good general reference for those interested in learning more about the LWA project is From Clark Lake to the Long Wavelength Array: Bill Erickson's Radio Science [ASP Conference Series, Vol. 345, Proceedings of the Conference held 8-11 September, 2004 in Santa Fe, New Mexico, USA. Edited by N. Kassim, M. Perez, M. Junor, and P. Henning]. These Proceedings contain a variety of papers which review scientific and technical aspects of the project during its early stage. You can also read more about Bill Erickson here.